Well, Another Quickpoll has ended with substantial while not surprising results. 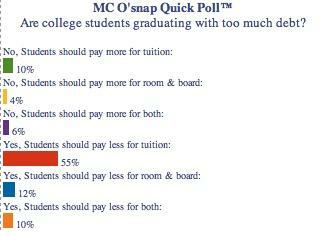 An overwhelming majority of you have stated that students are paying too much for tuition. On average, tuition tends to increase about 8% per year. This trend is more than likely to continue with inflation and rising costs continuing at their current strain. So factor these increases as you plan for future tuition costs. The IRS has recalculated the optional mileage rates of operating a vehicle for business, charitable, medical, or moving reasons. "A taxpayer may not use the business standard mileage rate for a vehicle after using any depreciation method under the Modified Accelerated Cost Recovery System (MACRS) or after claiming a Section 179 deduction for that vehicle. In addition, the business standard mileage rate cannot be used for any vehicle used for hire or for more than four vehicles used simultaneously." As a practicable matter, most businesses use these rates to reimburse employees for business-use of their personally-owned vehicles. This approach is convenient, efficient and provides for a safe-harbor election for reimbursing employees for bonafide business-use of automobiles when used in conjunction with an accountable reporting plan. As an option, businesses may choose to calculate the actual costs of operating personally-owned vehicles instead of using these standard mileage rates set by the IRS. However, the time and effort that it takes to collect, summarize and compute the business-portion of such actual costs typically is very time consuming and can distract businesses and employees from performing their normal duties. Such intangible costs should be considered before adopting a reimbursement policy based upon the business-portion of actual costs incurred. In addition, such approaches are often highly scrutinized upon audit by the IRS.